Paul Pogba says Ole Gunnar Solskjaer has made football fun again at Manchester United since taking over from Jose Mourinho. United have won 15 of their 19 matches under caretaker boss Solskjaer, with their form propelling them back into the top-four chase in the Premier League and the quarter-finals of the Champions League. Although they have lost back-to-back games against Arsenal in the Premier League and Wolves in the FA Cup, the Red Devils' performances and results have led to calls for Solskjaer to be given the manager's job on a permanent basis. 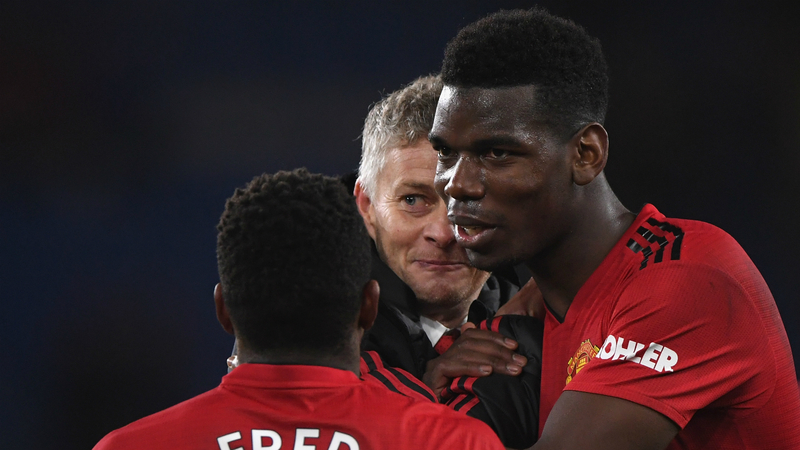 Pogba, who has backed Solskjaer to land the full-time post, admits United have enjoyed themselves more since the combustible Mourinho left in December. "We talk a lot about me but it's mostly down to the team," he told Eurosport. "It's going much better. We have a lot more of the ball. We attack a little more, too. I player higher and try to be a little more decisive. I was not so decisive before, but the stats proved it wasn't that bad. "I'm a challenger. I always want to do more. Since the new coach has arrived, we take more pleasure, we're happier and play more as a team. "When he came to talk to us, he asked us to enjoy playing football again. That's what we like - to play football." Ole: "Mountains are there to be climbed." The suspended Pogba watched from the stands as United beat Paris Saint-Germain 3-1 away to reach the Champions League's last eight, where they will face Barcelona. The midfielder claims it was a more stressful evening at Parc des Princes than it was during France's World Cup final triumph last year. Now, though, Pogba is relishing the prospect of facing Barca - a team he considers to be one of the best there is. "It's pretty strange. I think there was more pressure against PSG than in the final of the World Cup. [Marcus] Rashford's penalty... I was stressed, I was crazy," he said. "When you play football, you always believe - even after a 2-0 defeat. I was surprised because it was PSG; we know the players they have. In addition, we played at Parc des Princes, so they had the advantage. "Barcelona are a team I always watch. You can always learn as a midfielder. I like watching football. "Their system of playing, their culture... it can always help me. Barca is a great team, one of the best in the world. They have extraordinary players and it's a match where I want to have fun. Playing against one of the best teams in the world is always a pleasure. "They're a team I lost against in the Champions League final. It's always good to play against the best."